Journalism Library Guides & Tools page, including Scoping Out Your Beat! Have questions? Email journalism@libraries.cul.columbia.edu for more information, to ask research questions or to set up appointments for research consultations. This entry was posted in Beat Reporting, Blogs & Resources, Cheat Sheets & Guides, Columbia University Libraries, MS Students, Research Tips and tagged CLIO, orientation, twitter on May 24, 2013 by Cris. Don't leave home without this bookmark! This entry was posted in Columbia University Libraries, Widgets & Tools and tagged CLIO, Columbia Libraries, mobile, services, widgets on March 14, 2012 by Cris. 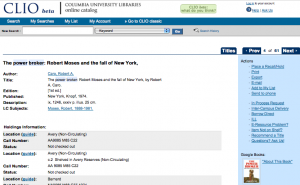 Have you tried CLIOmobile, the mobile version of Columbia’s online catalog? 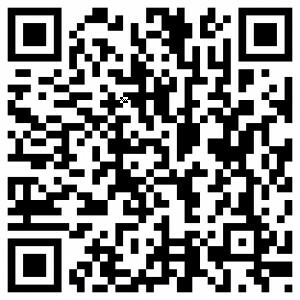 This entry was posted in Columbia University Libraries, Research Tips, Widgets & Tools and tagged announcements, CLIO, Columbia Libraries, QR codes, widgets on May 24, 2011 by Cris. 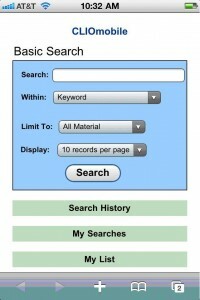 CLIO, the Libraries’ online catalog, now has a mobile interface – CLIOmobile – for use with your smart phone or mobile device! This entry was posted in Columbia University Libraries, Research Tips, Service Announcements, Widgets & Tools and tagged catalog, CLIO, widgets on November 9, 2010 by Cris. Have you seen the new CLIO? With extra built in functionality, like book covers with search results, permanent URLs for each item, and the ability to text or email a title, location, and call number for an item, it’s a must-see! Feeling nostalgic? You can still get to CLIO Classic! Let us know what you think about the new CLIO send feedback! For questions, please check CLIO Help or ask a librarian. This entry was posted in Books, Columbia University Libraries, Electronic Resources, Newspapers, Research Tips, Widgets & Tools and tagged CLIO on January 27, 2010 by Cris. Reminder-Last DIY research workshop tomorrow!